Nicola flies off with top award! Congratulations to our Birds Section Leader Nicola Wright who has flown away with this month’s Employee of the Month award. Nicola, who has worked at DZG for 12 years, was given the top title, alongside a certificate and gift vouchers after great feedback from managers and visitors. Zoo Director Derek Grove said: “Nicola’s dedication to … Continue reading Nicola flies off with top award! Senior Keeper and mum-to-be Laura Robbins has been named Employee of the Month and celebrated the top title with tapir mum Meena. 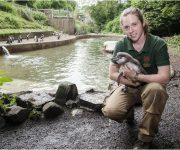 Laura, who joined DZG 14 years ago and works part-time, won praise from staff and visitors for her dedication to the job and for making animal experiences so enjoyable for participants. 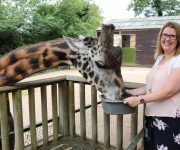 Zoo Director … Continue reading Top job Laura! 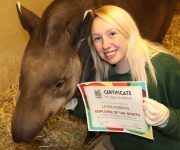 DZG’s Laura Partridge has been handed the Employee of the Month title for her continued dedication despite having broken her arm. 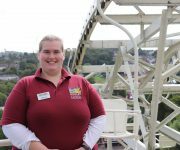 The 28-year-old Customer Services Team Member from Tipton, who works with our Little Keepers for the day, in Lorikeet Lookout, in the Farm Barn, the beach and on the chairlift, won praise for working … Continue reading Great going Laura! Keeper Josh Luxton was a popular choice for this month’s Employee of the Month award after receiving multiple nominations. The 24-year-old got great feedback from visitors participating in meet and greet experiences and won praise for helping the media and marketing team promote the zoo. In May, his Facebook Live broadcast to celebrate our young … Continue reading Great work Josh! 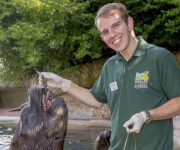 DZG’s Chris Leeson has clinched our employee of the month title for his animal campaign work and helping run our stores. 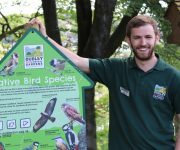 The 26-year-old Conservation Officer, who has been at the zoo for four years, was nominated by several members of the management team and a keeper on our birds section. As well as raising awareness … Continue reading Cracking job Chris! 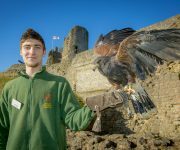 Our latest Employee of the Month, Langan Turner, came to the aid of some visitors who braved a blizzard to get to DZG. 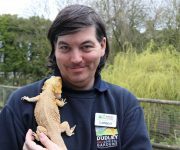 The Education Presenter, who gives daily talks, runs school workshops and looks after our small animals in the Discovery Centre, was nominated for the award by several members of the zoo team … Continue reading Langan’s a star!